The road construction boom following World War II gave Charlie Finn an idea that revolutionized how labor and materials are used on the job site. He called his concept the FINN Straw Blower, and with it offered landscape contractors the opportunity for amazing gains in efficiency and profit. FINN Straw Blowers multiply your productivity and profits by doubling straw coverage in a fraction of the time it takes to apply by hand. There’s no more efficient way to ensure soil moisture retention and protect against erosion damage to freshly seeded areas. 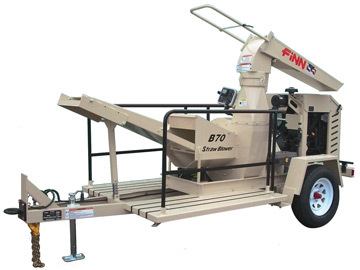 Designed to deliver smooth, reliable power for maximum straw shredding and discharge, FINN Straw Blowers make quick work of straw mulching even in the most demanding conditions. FINN offers a technologically advanced line of Straw Blowers to handle jobs ranging from small lawns to massive mining sites. Optional 50 foot extension hose reaches difficult areas with more controlled discharge. Allows for easy one-handed control and reduces operator fatigue. A variety of mechanical, electrical, and hydraulic clutch designs are used enabling independent control of the blower and engine with efficient power transmission. Separates the straw instead of cutting it, yielding uniform length and a stable straw matrix to protect seed.